Eufemed - European federations in early clinical medicines development. The founding associations include: the Belgian Association for Phase-I Units (BAPU, Belgium), Club Phase I (France), the Association for Applied Human Pharmacology (AGAH, Germany) and the Association for Human Pharmacology in the Pharmaceutical Industry (AHPPI, United Kingdom). Because of the successful collaborations between these national societies since 2007, their comparable objectives and the growing importance of early clinical drug development in Europe as a region, BAPU, Club Phase I, AGAH and AHPPI decided to join forces for more structured collaborations. 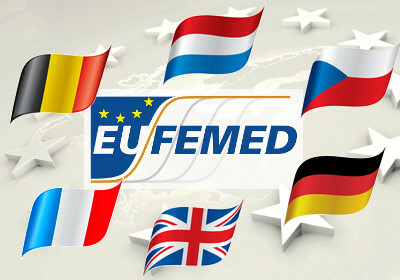 As a result EUFEMED was founded: a federation of national societies and a “voice” in the interest of exploratory medicines development in Europe. EUFEMED is a not for profit association established under the Belgian law. The mission statement of the federation addresses the development, protection and promotion of the interests of early clinical medicines research and development in Europe. develops standards and promotes guidance documents in early medicines development in order to improve European competitiveness. In line with these objectives, EUFEMED has been recognized as a stakeholder by EMA and is consulted for the revision of important European guidelines related to early clinical drug development. In order to strengthen the voice of EUFEMED and in the importance of early medicines development in Europe, other societies and additional countries are invited to become members. Together we can shape a brighter future!